A meaty mushroom meant for soups and stews. 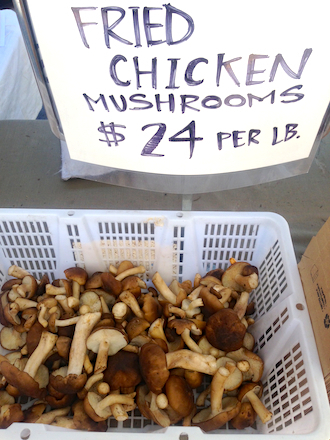 David West patrols his Clearwater Farms stall at the Santa Monica Farmers’ Market like a shepherd. Pick out a few shiitakes or chanterelles and he’ll help you bag them up while gently offering advice on how to store, prepare, and pair the ‘shrooms. Recently, my eyes landed upon his Fried Chicken Mushrooms. I had to have them—if for no other reason than the fact that they were named for one of my favorite foods. I filled my palms with a few of the fungi and inhaled. West caught me mid-sniff and said, “Woodsy and herbaceous, right?” He went on, “they cook up like okra, but without the sliminess. 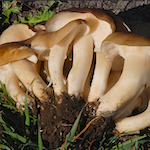 They’re great in stews and soups or anywhere they can be cooked for hours.” Currently harvested up North near Mendocino, the mushrooms are meaty enough even for a bleeding heart carnivore. I closed my eyes and stuck my nose in the brown bag West handed over. It smelled like far away forests, rosemary, and the chicken fricassée I was going to make for dinner.